TMA members are keen travellers too! 2. Group purchasing to give members (only members – not everyone in the clinic where they work ) better prices and better access to products than may be achieved by a single member; i.e. vaccines, medical kits, mosquito nets, stationary, and promotional materials. We also have a more secure supply line for our vaccines so we often have supply when others have run out. 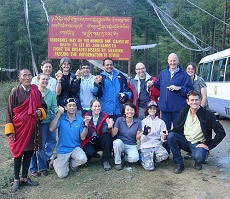 Members are individual doctors, (not a clinic) with expertise in Travel Medicine. Members must be Yellow Fever accredited. Members must participate in ongoing travel medicine training, and must attend the annual TMA training meetings. Most members are general practitioners, many in smaller clinics doing travel medicine in a GP setting. Members who work in group practices are responsible to ensure other doctors in the practice who are working travel medicine sessions also join pro rata if the other doctors in their practice will be utilising the TMA member services, particularly using discounted vaccines. Members must not be a member of any of the other travel medicine groups. Members may not be in close proximity to existing members – this “distance” varies in different locations. TMA is not a franchise so there are no franchise fees. TMA is a club with a detailed membership agreement. Vaccines and supplies are purchased direct from suppliers at discounted prices. Members are not obligated to participate in special deals, however members usually find that the savings on vaccines and goods covers the membership fee. Membership includes conference fees for the member to attend the annual meeting and dinner. TMA believes that the most effective marketing is local. We refer between clinics and we share ideas about how to spread our message of healthy travel more effectively. We share resources, but we do not spend funds on big national advertising campaigns. If your goal is purely to access cheap vaccines, this is really not the organisation for you. We are not at liberty to divulge our special prices to everyone who asks. Strict confidentiality is part of our arrangement with our suppliers. We understand it is necessary for you to know the prices, in order to determine if it is ‘worth joining’. However you will need to to complete the application and confidentiality form and go through the process. We also keep a physical distance between fellow members, to ensure we are not competing for patients. This distance varies in different places and is at the discretion of the existing members. This organisation also requires participation, eg writing the group newsletter once every two years, undertaking training and assisting other members. The ultimate goal is giving our travelling patients the best possible service. If this sounds like a ‘good fit’, we look forward to hearing from you. We have had an unspeakably delightful journey, one of those journeys which seem to divide one's life in two, by the new ideas they suggest and the new views of interest they open. Of the gladdest moments in human life, methinks, is the departure upon a distant journey into unknown lands. Shaking off with one mighty effort the fetters of Habit, the leaden weight of Routine, the cloak of many Cares, and the slavery of Home, man feels once more happy.